For this and other readers of David Mazzucchelli’s at the time almost revelatory work in Rubber Blanket and elsewhere in the rather meagre early- to mid-nineties, the wait for his Next Big Thing had become a thing unto itself, a running joke with undertones of rapt anticipation. It has been so long since we first heard of this project, since his and Paul Karasik’s better-than-the-original adaptation Paul Auster’s City of Glass (1994), that expectations could only have diminished. A few unpersuasive, short anthology pieces along the way did not help spur confidence, and neither did the fact that we saw such a proliferation of great comics by other creators in the interim. But now that it is here, Asterios Polyp cannot help but revive this sense of promise, especially since it makes no bones about its ambition to be a Great Work. It’s no coincidence that Mazzucchelli patterns his work on the Odyssey, or that he wears his modernist ambitions on his sleeve in a way that cannot but recall that of Joyce when he did the same thing in his medium of choice. In this sense, Asterios is perhaps the most self-conscious manifestation so far of the notion — provisionally expounded in L’Association’s Éprouvette a few years back and more recently elaborated upon by Bart Beaty — that comics are currently experiencing a kind of delayed modernism; a period of heightened formal reflexivity, increased interest in psychological realism, and vigorous transcendence of the medium’s traditional forms and thematic concerns. Asterios is all that — it’s a work of rare formal complexity by an almost hyper-aware creator, which attempts a daring marriage of the archetypical models of the cartooning tradition with psychological verisimilitude. Much has already been made of the clockwork-like formal construction of the book. It represents the world-view of a protagonist whose efforts at ordering his life border on the hubristic, and as we shall see, its power ultimately lies in what eludes this system of construction (follow the airplane and triangulate the time of the final scene for extra effect). As Mazzucchelli subtly acknowledges, Asterios is no Dr. Manhattan, despite his best efforts to see the strings of his fate. Crucially, Mazzucchelli’s own effort reflects this aspiration. One gets the ultimately false sense that nothing is random, neither in the story itself, nor in its creation — that nothing committed to the delicate Japanese paper on which the book is printed got there by accident, but rather through fifteen years of careful deliberation (astonishingly consistent, one wonders how much of the book was redrawn, and how many times). This has both fascinating and problematic consequences to which I shall return later. As mentioned, fine efforts have already been made to chart some of the complex — at times exceedingly clever — formal mechanisms at play in the book, but lest this end up a critics’ parlour game, I shall endeavour to steer clear of enumerating too many more here. Rather, let’s look at some of the concerns that make the work tick. At its heart, it is a love story. Asterios Polyp, the successful paper architect, lost his marriage to the sculptor Hana Sonnenschein somewhere along his self-sufficient way, and, upon also losing his home to a fire, embarks on a journey to nowhere in particular, in order to change the course of his life and eventually to seek reconciliation with the love of his life. For a book that seeks to fathom everything important about existence, not the worst of premises. But does it succeed? Mazzucchelli’s main strategy, as indicated, is reaching toward naturalism through the use of archetype. His aspirations could be superficially described as ‘literary’, but Asterios is emphatically a comic. Its vocabulary is graphic and sequential, fine-tuned by an artist who was already highly accomplished before he started teaching comics at RISD sometime in the mid-90s — now we know from whence the seemingly sui generis Dash Shaw sprang! — and has now reached a level of mastery attained only by the select few. We’re talking Chris Ware level of control here. A textbook example for the literary crowd if one is needed — and it might well be — that graphic novels are not, actually, novels with pictures in them. And he goes all out. In a literary context, having a couple lying in bed approximating the yin/yang, coupled with repeated reference to “Aristophanes’” notion, in Plato’s Symposium, that the primordial human was spherical in shape, before Zeus rent it asunder to create Man and Woman, ever since vainly seeking completeness in each other, coupled with a grandly orchestrated recreation of the myth of Orpheus and Eurydice featuring the main characters, in a love story, would likely — let’s be charitable — be construed as a tad obvious, even unsubtle. Nevertheless, Mazzucchelli does that, and (much) more, including hammering home again and again the central motif of dualism beyond any reasonable sense of literary propriety. Whether it works or not depends, inevitably, on your mileage as a reader, but it is certainly executed with full confidence, flowing eloquently from his pen. Not a hint of irony. (Thankfully, I should add). True to the cartooning tradition within which he works, Mazzucchelli makes use of these symbolic devices to elucidate his narrative, condensing real-world experience into iconic form. Perhaps most notably, he letters each character’s voice distinctly and varies their graphic appearance on the page to match their individual personalities — something he accentuates further for the scenes of conflict between Asterios and Hana, in which their appearances morph into symbolic forms meant to encapsulate their most basic character traits and elucidate the difference between them. Like Art Spiegelman before him, Mazzucchelli evidently believes firmly in the value of this kind of cartoon shorthand for conveying complex truths about the human condition. A belief that the language of comics is perfectly suited to such an endeavour and that naturalism in the medium shouldn’t necessarily be sought exclusively in the more restrained — might we say ‘literary’? — graphic approach of, say, the Hernandez Brothers or Adrian Tomine. (Which Mazzucchelli also happens to master — see, for example, the teaching sequence with Hana; the disposition of each of the students, as they listen and comment, is acutely observed). The ‘funny animal’ metaphor in Maus functions both internally and externally. It represents the ethnic stereotyping that fed the Holocaust, both as held by the characters in the story and, in a different way, by us, the readers. At the same time, it works as a Brecthtian device sustaining our intellectual contemplation of the story, instead of losing us in the kind of graphic depiction of the horrors narrated that would inevitably come up short. It allows Spiegelman to show the unspeakable. Mazzucchelli’s approach is different. He shows us the invisible. The graphic representation happens on a narrative level above that directly experienced by the characters, directing the reader’s understanding of their inner lives and states of mind. In this, Mazzucchelli’s approach is more like that of David B., who in most of his work — most notably in the autobiographical L’Ascension du haut mal (Epileptic) — projects his own inner life onto the page in symbolic cartoon form. But where he imbues his imagery with multivalent, oneiric mystery, Mazzucchelli appears prescriptive. To the uncharitable eye, this might be considered reductive, and thus a weakness of a work that ultimately seeks to convey truth. And, to make matters worse, the perspectives it provides don’t transcend the intellectual commonplace — dualism as both constituent of rationality and as foundation myth, reality as a concept determined by our individual experience, etc. — but this matters less, since the heart of the work is elsewhere. It would seem that this is what Mazzucchelli is facilitating, but as indicated earlier, he appears simultaneously to be attempting to immerse the reader, microcosmically, in a worldview analogous to that of the story’s frustratingly prescriptive protagonist. The story is entirely narrated from Asterios’ point of view — or that of his dead twin, which amounts to the same thing. He is in every scene and is our point of access even to Hana. This becomes most strikingly apparent during their argument, in which she breaks down and suddenly tells him something entirely unexpected. Earlier, the veil has been lifted momentarily on an equally unexpected, troubling truth about her childhood, and it seems Asterios has forgotten all about it, until it reemerges calamitously in that scene. The fact that Mazzucchelli seems so eager to feed certain points to us shrouds somewhat how much is left unsaid about the characters’ inner lives and what happens between them. Why is this? Asterios does not seem preoccupied with the question, at least not on a conscious level, but he does exhibit fatherly warmth toward the story’s only child, Jackson, to whom he gives the token of his own childhood, the magnetic watch, recognising perhaps that this will remain a road not taken for him. Might the absence of a child, concretely or even hypothetically, ultimately be what sundered their marriage? We can only guess, but Hana’s troubles might well be at the heart of the issue, and concerns about loss, occasioned by Asterios’ obsession with his lost twin, might also play into it. This, then, I think rather is the hole at the centre of the work, which Douglas Wolk located in his review as its modernist badge of honour. Asterios is a story about the unsaid that determines our lives, while we are busy making sense of them in other ways. The prescriptive presentation of the story thus fully corresponds with the modernist tradition of having every aspect of a novel emanate directly from its protagonist. Mazzucchelli symbolically maps the motion of Asterios’ mind, encouraging the attentive reader to fill in the blanks. He provides us with plenty of intellectual tools with which to do this, but keeps his emotional engagement close to the vest. 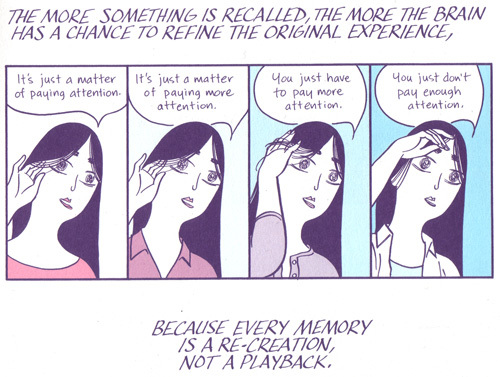 Only in the powerful sequence where Asterios’ memories of Hana’s presence flood over him, does Mazzucchelli let feeling dictate the reading experience. It’s all Asterios allows himself, and the risk Mazzucchelli runs is that the reader will find it insufficient. As a result, the transformation Asterios undergoes, though perfectly understandable and sympathetic, seems somewhat unearned, unenlightening even. Although we’ll never know, it would appear the celestial bodies that move so crucially at the very end concur. Asterios is limited because it mirrors the limitations of Asterios. The originality of its vision, then, lies not in its portrayal of human emotion but rather in the art of its construction, and in what it leaves to our imagination. A beautiful paper architecture. 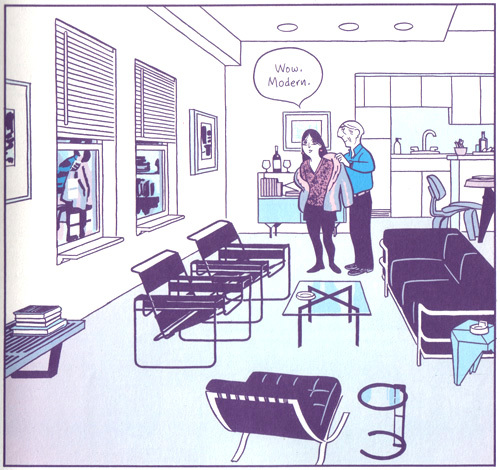 David Mazzucchelli, Asterios Polyp, New York, Pantheon, 2009. c. 340 pages, colour, $29.95. Comics Comics has a streamed interview online with Mazzucchelli about Asterios Polyp and his other work, and here’s my essay, written a decade ago, about his short masterpiece “Big Man”. Thanks to Emma, Thomas and Henry for input. Nothing terribly intelligent to add, just giving kudos for a really well-written piece. Thumbs up! Thanks for the kind words! Keep up the good work at tegneseriesiden.dk! The airplanes have been plaguing me. What do you mean by triangulate to find the time of the final event? Can you offer some assistance? Thank you! Good point, it wouldn’t be snowing that early in Minnesota. I wonder whether this is just an error, or whether the 11th occurs earlier in the narrative. One might be able to pinpoint it by reading closely. (Another thematic kink in this respect is that none of the hijacked flights took off from the Twin Cities). In any case, I think the airplane motif, the twin tower-like structures recurring, and the theme of absence all play into the national trauma pretty clearly. WoW! I’m thankful I read your review. It blew my mind. I love how you included Ignazio’s (who is basically Asterois) vision as being evident in the entire book’s style…. Thank you!!! That is why I surf the net… I knew I didn’t find a lot of people’s reviews satisfying enough but with yours I feel like I’m getting somewhere. I knew the book isn’t “great” because it DOES lack “heart” but at the same time I knew it was FASCINATING because of its style. Style over substance can be quite interesting! Natty, Thanks for the kind words! I’m glad you enjoyed the article. I kind of agree that AP lacks heart, but perhaps not as much as one might think, as I try to argue.